The world of biology is filled with labs where living creatures are cultured and studied, where the dynamics of life are explored and analyzed to learn about behavior, reproduction, structure, growth and so much more. In the field of astrobiology, however, you don’t see much lab biology — especially when it comes to the search for life beyond Earth. The field is now largely focused on understanding the conditions under which life could exist elsewhere, modeling what chemicals would be present in the atmosphere of an exoplanet with life, or how life might begin as an organized organism from a theoretical perspective. Yes, astrobiology includes and learns from the study of extreme forms of life on Earth, from evolutionary biology, from the research into the origins of life. But the actual bread and butter of biologists — working with lifeforms in a lab or in the environment — plays a back seat to modeling and simulations that rely on computers rather than actual life. There are certainly exceptions, and one of the most interesting is the work of Mary “Niki” Parenteau at NASA’s Ames Research Center in the San Francisco Bay area. A microbiologist by training, she has been active for over five years now in the field of exoplanet biosignatures — trying to determine what astronomers could and should look for in the search for extraterrestrial life. 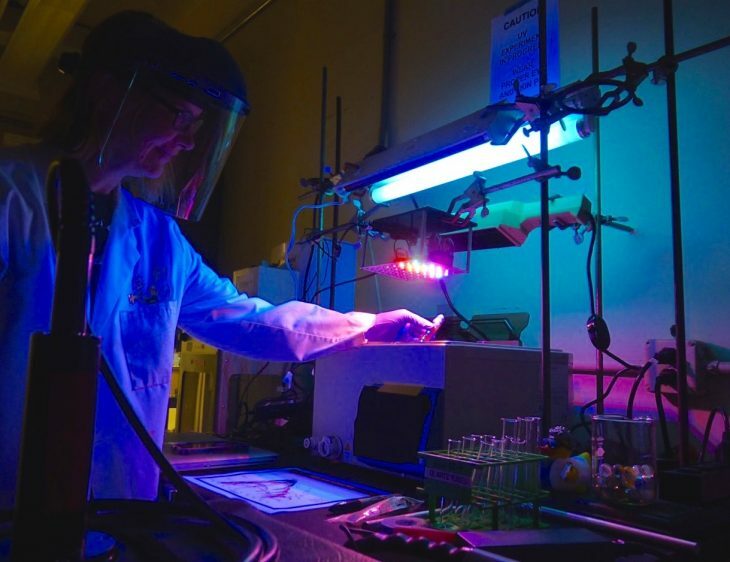 Working in her lab with actual live bacteria in laboratory flasks, test tubes and tanks, she is conducting traditional biological experiments that have everything to do with astrobiology. She takes primitive bacteria known to have existed in some form on the early Earth, and she blasts them with the radiation that would have hit the planet at the time to see under what conditions the organisms can survive. She has designed ingenious experiments using different forms of ultraviolet light and a LED array that simulate the broad range of radiations that would come from different types of stars as well. What makes this all so intriguing is that her work uses, and then moves forward, cutting edge modeling from astronomers and astrobiologists regarding thick photochemical hazes understood to have engulfed the early Earth — making the planet significantly colder but also possibly providing some protection from deadly ultraviolet radiation. That was a time when the atmosphere held very little oxygen, and when many organisms had to make their living via carbon dioxide and sulfur-based photosynthesis that did not use water and did not produce oxygen. This kind of photosynthesis has been the norm for much of the history of life on Earth, and certainly could be common on many exoplanets orbiting other stars as well. So anything learned about how these early organisms survived in frigid conditions with high ultraviolet radiation — and what potentially detectable byproducts they would have produced under those conditions — would be important in the search for biosignatures and extraterrestrial life. 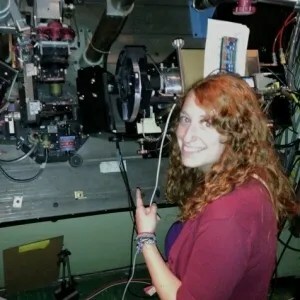 Parenteau has spent years learning from astronomers working to find ways to characterize exoplanet biosignatures, and she has been eager to convert her own work into something useful to them. Recent work by NASA Goddard Space Flight Center astronomer and astrobiologist Giada Arney and colleagues points to the existence of a thick haze around the early Archean Earth and probably today around some, and perhaps many, exoplanets. This haze — which is more like pollution than clouds — is produced by the interaction of strong incoming radiation and chemicals (most commonly methane and carbon dioxide) already in the atmosphere. The haze, Arney concluded based on elaborate modeling of those radiation-chemical interactions, would be hard on any life that might exist on the planet because it would reduce surface temperatures significantly, though probably not always fatally. Ozone in our atmosphere now plays the role of blocking the most destructive forms of UV radiation, but ozone is formed from oxygen and on early Earth there was very little oxygen at all. It’s difficult enough to sort through the potentially protective role of a haze on early Earth. To do it for exoplanets requires not only an understanding of the effects of a haze on ultraviolet light, but also how the dynamics of a haze would change based on the amounts and forms of radiation emitted by different types of stars. It’s all very complicated, but the answers needn’t be theoretical, Arney concluded. They could be tested in a lab. And that’s where Parenteau comes in, with her desire and ability to design biological experiments that might help scientists understand better how to look for life on distant exoplanets. Parenteau’s experiment at first looks pretty low-tech, but in fact it’s very much custom-designed and custom-built. Before designing and making her own LED board with Ames intern Cameron Hearne, Parenteau met with solar panel specialists who might be able to provide an instrument she could use, but it turned out they were very expensive and not nearly as versatile as she wanted. Having grown up on a farm in northern Idaho, Parenteau is comfortable with making things from scratch, and her experiments reflect that comfort and talent. “Imagine the cells as soap bubbles in a clear glass. If you look through the glass, the soap bubbles prevent you from seeing through and the glass has a higher ‘optical density.’ However, if you pop or lyse the soap bubbles, suddenly you can see through the glass and the optical density decreases. The Parenteau-Arney collaboration is being funded through a National Astrobiology Institute grant to the University of Washington’s famously-interdisciplinary Virtual Planetary Laboratory. 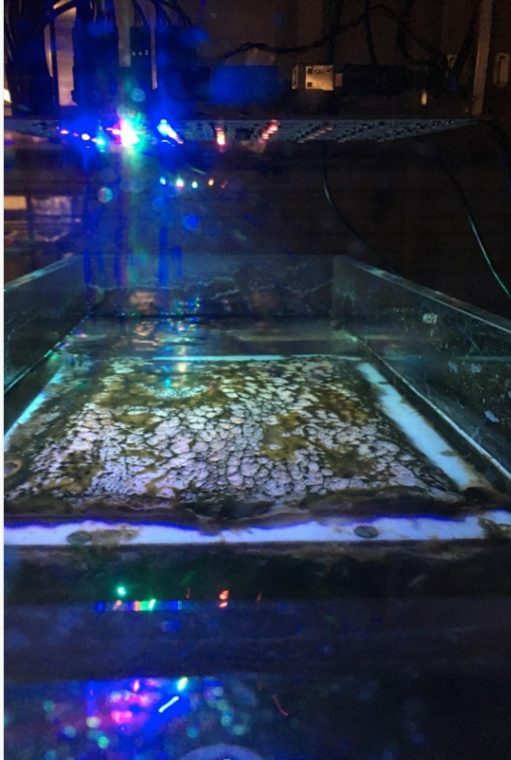 The microbes-and-haze experiment is one of many that Parenteau is working on in the general field of biosignatures. While the haze experiment is primarily designed to determine if microbes could survive a UV bombardment if a haze was present, she is also working on the central question of what might constitute a biosignature. With that in mind, she is also measuring the gases produced by microbes under different radiation and atmospheric conditions, and that is directly applicable to searching for extraterrestrial life. If and when she does find particularly interesting results in the gas measurements inside the anaerobic glove box, she says, she knows where to go. Those gases, Parenteau says, may be photochemically altered as they as they rise through the planet’s atmosphere to the upper levels where they could be detected by the telescopes of the future. But in the challenging and complex world of biosignatures, every bit of hard-won data is most valuable since it could some day lead to a discovery for the ages. In 2014, a journal paper authored by Fabienne Bastien [The Astrophysical Journal] from Vanderbilt University suggested that nearly half of the brightest stars observed by the Kepler Space Telescope are not regular stars like our sun, but actually are distant and much larger sub-giant stars. Such an error would mean planets around these stars are 20 – 30% larger than estimated, a particularly hard punch for the exoplanet community as planets around bright stars are prime targets for follow-up studies. Previous improvements in the accuracy of the measured radii and other properties of stars have already proved their worth. In 2017, a journal paper led by Benjamin Fulton [The Astrophysical Journal]at the University of Hawaii revealed the presence of a gap in the distribution of sizes of super Earths orbiting close to their star. Planets 20% and 140% larger than the Earth appeared to be common, but there was a notable dearth of planets around twice the size of our own. The most popular theory for this gap is that the peaks belong to planets with similar core sizes, but the planets with larger radii have deep atmospheres of hydrogen and helium. This would make the planets belonging to the smaller radii peak true rocky worlds, whereas the second peak would be mini Neptunes: the first evidence of a size distinction between these two regimes. This split in the small planet population was spotted due to improved measurements of planet radii based on higher precision stellar observations made using the Keck Observatory. 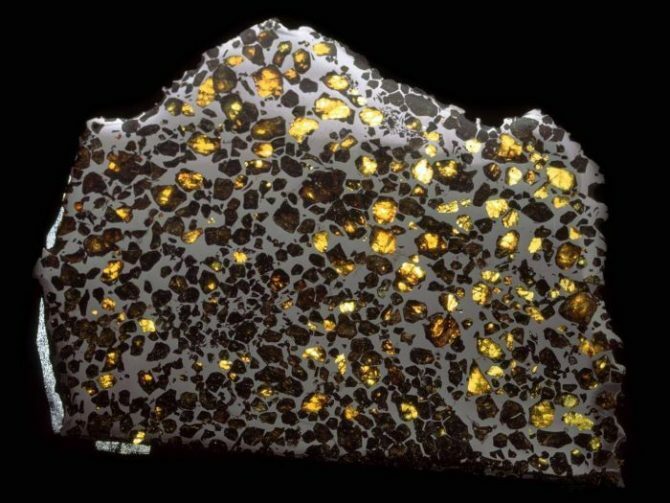 With a gap size of only half an Earth-radius, it had previously gone unnoticed due to the uncertainty in planet size measurements. Both the concern of a significant error in planet sizes and the tantalizing glimpse at the insights that could be achieved with more accurate data is why Gaia is so exciting. Launched on December 19, 2013, Gaia is a European Space Agency (ESA) space telescope for astrometry; the measurement of the position and motion of stars. The mission has the modest goal of creating a three-dimensional map of our galaxy to unprecedented precision. Gaia measures the position of stars using a technique known as parallax, which involves looking at an object from different perspectives. Parallax is easily demonstrated by holding up your finger and looking at it with one eye open and the other closed. Switch eyes, and you will see your finger moves in relation to the background. This movement is because you have viewed your finger from two different locations: the position of your left eye and that of your right. The degree of motion depends on the separation between your eyes and the distance to your finger: if you move your finger further from your eyes, its parallax motion will be less. By measuring the separation of your viewing locations and the amount of movement you see, the distance to an object can therefore be calculated. Since stars are far more distant than a raised finger, we need widely separated viewing locations to detect the parallax. This can be done by observing the sky when the Earth is on opposite sides of its orbit. By measuring how far stars seem to move over a six month interval, we can calculate their distance and precisely estimate their size. This measurement was first achieved by Friedrich Wilhelm Bessel in 1838, who calculated the distance to the star 61 Cygni. Bessel estimated the star was 10.3 light years from the Earth, just 10% lower than modern measurements which place the star at a distance of 11.4 light years. However, measuring parallax from Earth can be challenging even with powerful telescopes. The first issue is that our atmosphere distorts light, making it difficult to measure tiny shifts in the position of more distant stars. The second problem is that the measured motion is always relative to other background stars. These more distant stars will also have a parallax motion, albeit smaller than stars closer to Earth. As a result, the motion measured and hence the distance to a star, will depend on the parallax of the more distant stars in the same field of view. This background parallax varies over the sky, leaving no way on Earth of creating a consistent catalogue of stellar positions. These two conundrums are where Gaia has the advantage. Orbiting in space, Gaia simply avoids atmospheric distortion. The second issue of the background stars is tackled by a clever instrument design. 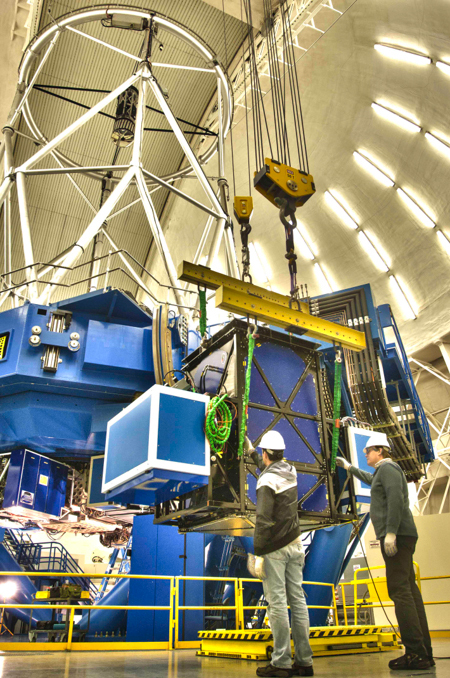 Gaia has two telescopes that point 106.4 degrees apart but project their images onto the same detector. This allows Gaia to see stars from different parts of the sky simultaneously. The telescopes slowly rotate so that each field of view is seen once by each telescope and overlaid with a field 106.4 degrees either clockwise or counter-clockwise to its position. The parallax motion of stars during Gaia’s orbit can therefore be compared both with stars in the same field of view, and with stars in two different directions. Gaia repeats this across the sky, linking the fields of view together to globally compare stellar positions. This removes the problem of a parallax measurement depending on the motion of stars that just happen to be in the background. The result is the relative position of all stars with respect to one another, but a reference point is needed to turn this into true distances. For this, Gaia compares the parallax motion to distant quasars. Quasars are black holes that populate the center of galaxies and are surrounded by immensely luminous discs of gas. Being outside our Milky Way, the distance to quasars is so great that their parallax during the Earth’s orbit is negligibly small. Quasars are too rare to be within the field of view of most stars, but with stellar positions calibrated across the whole sky, Gaia can use any visible quasars to give the absolute distances to the stars. What did these precisely measured stellar motions do to the properties of the orbiting planets? Did our small worlds vanish or the intriguing division in the sizes of super Earths disappear? This was bravely investigated in a journal paper this month led by Travis Berger from the University of Hawaii. By matching the stars observed by Kepler to those in the Gaia catalogue, Berger confirmed that the majority of bright stars were indeed sun-like and not the suspected sub-giant population. However, the more precise stellar sizes were slightly larger on average, causing a small shift in the observed small planet radii towards bigger planets. The same result was found in a parallel study led by Fulton, who found a 0.4% increase in planet radii from Gaia compared with the (higher precision than Kepler, but less precision than Gaia) results using Keck. 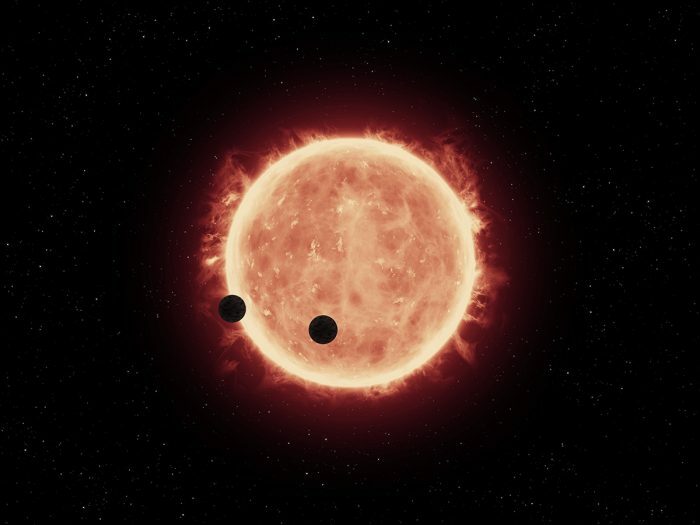 The papers authored by Berger and Fulton investigated the split in super Earth sizes on short orbits, confirming that the two planet populations was still evident with the high precision Gaia data. Further exploration also revealed interesting new trends. Fulton noticed that two peaks in the super Earth population appear at slightly larger radii for planets orbiting more massive stars. This is true irrespective of the level radiation the planets are receiving from the star, ruling out the possibility that more massive stars are simply better at evaporating away atmospheres on bigger planets. Instead, this trend implies that bigger stars build bigger planets. Models proposed by Sheng Jin (Chinese Academy of Sciences) and Christoph Mordasini (the Max Planck Institute for Astronomy) in a paper last year [The Astrophysical Journal] proposed that the location of the split in the super Earth population could be linked to composition. Planets made of lighter materials such as ices would need a larger size to retain their atmospheres, compared to planet cores of denser rock. If the planet size at the population split marks the transition from large rocky worlds without thick atmospheres to mini-Neptunes enveloped in gas, then it corresponds to the size needed to retain that gas. 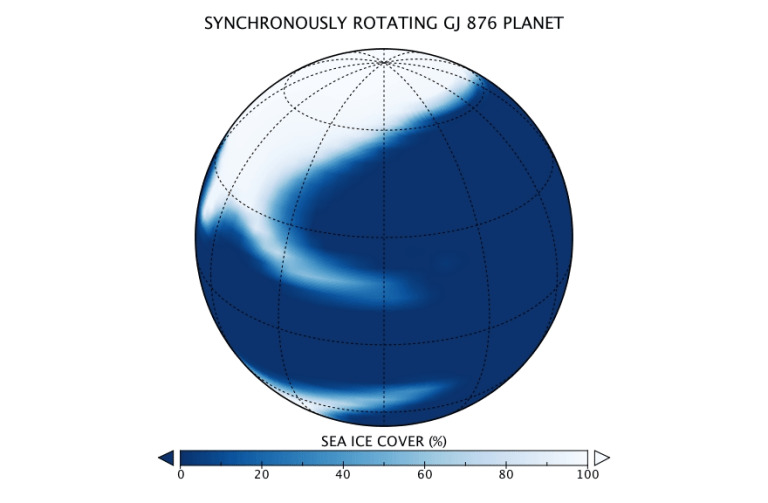 Berger suggests that the gap between the planet populations seen in the new Gaia data is best explained by planets with an icy-rich composition. As these planets all have short orbits, this suggests these close-in worlds migrated inwards from a much colder region of the planetary system. The high precision planet radii measurements from Gaia seem to leave our planet population intact, but suggest new trends worth exploring. This will be a great job for TESS, NASA’s recently launched planet hunter that is preparing to begin its first science run this summer. Gaia’s astrometry catalogue of stars will be ensuring we get the very best from this data. Precisely how far back do we look when trying to understand the origins of life? Do we look to Darwin’s “warm little pond?” To the Miller-Urey experiment’s conclusion that organic building blocks of life can be formed by sparking some common gases and water with electricity? To an understanding the nature and evolution of our atmosphere? The answer is “yes” to all, as well as to scores of additional essential dynamics of our galaxies. Because to begin to answer those three questions, we also have to know how planets form, the chemical make-up of the cosmos, how different suns effect different exoplanets and so much more. This is why I was so interested in reading about a breakthrough approach to understanding the shape and nature of interstellar clouds. Because it is when those clouds of gas and dust collapse under their own gravitational attraction that stars are formed — and, of course, none of the above questions have meaning without preexisting stars. In theory, the scope of astrobiology could go back further than star-formation, but I take my lead from Mary Voytek, chief scientist for astrobiology at NASA. The logic of star formation is part of astrobiology, she says, but the innumerable cosmological developments going back to the Big Bang are not. So by understanding something new about interstellar clouds — in this case determining the 3D structure of such a “cloud” — we are learning about some of the very earliest questions of astrobiology, the process that led over the eons to us and most likely life of some sort on the billions of exoplanets we now know are out there. Cepheus B, a molecular cloud located in our Milky Galaxy about 2,400 light years from the Earth, provides an excellent model to determine how stars are formed. 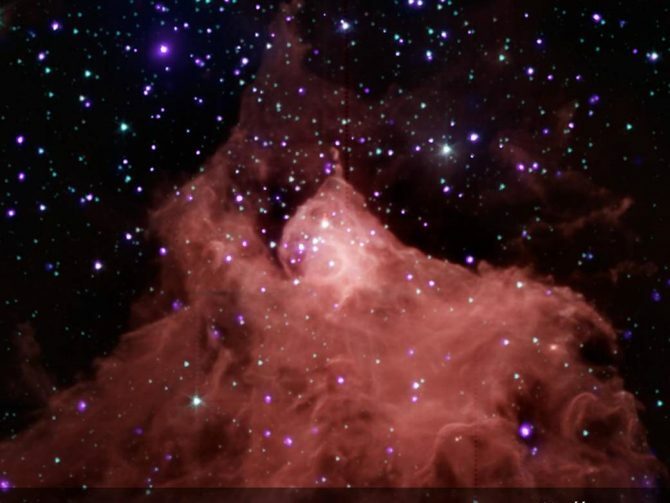 This composite image of Cepheus B combines data from the Chandra X-ray Observatory and the Spitzer Space Telescope.The Chandra observations allowed the astronomers to pick out young stars within and near Cepheus B, identified by their strong X-ray emission. Credits X-ray: NASA/CXC/PSU/K. Getman et al. ; IRL NASA/JPL-Caltech/CfA/J. Wang et al. 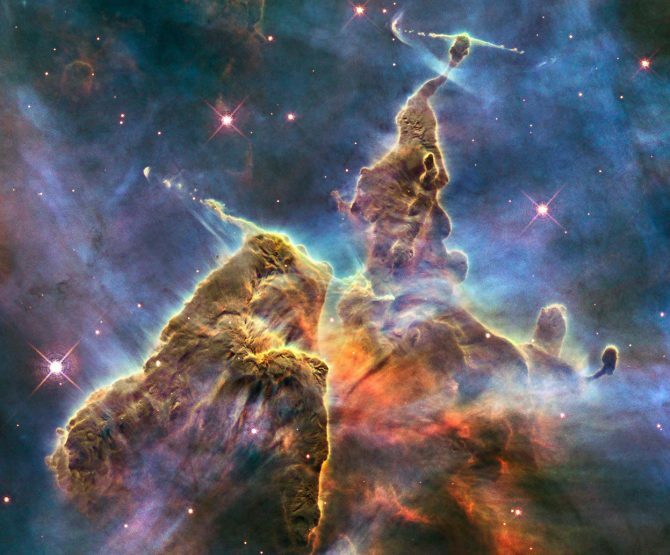 So, what is an interstellar cloud? It’s the generic name given to an accumulation of gas, plasma, and dust in our and other galaxies, left over from galaxy formation. So an interstellar cloud is a denser-than-average region of the interstellar medium. Hydrogen is its primary component, and that hydrogen exists in a wide variety of states depending on the density, the age, the location and more of the cloud. Until recently the rates of reactions in interstellar clouds were expected to be very slow, with minimal products being produced due to the low temperature and density of the clouds. However, organic molecules were observed in the spectra that scientists would not have expected to find under these conditions, such as formaldehyde, methanol, and vinyl alcohol. 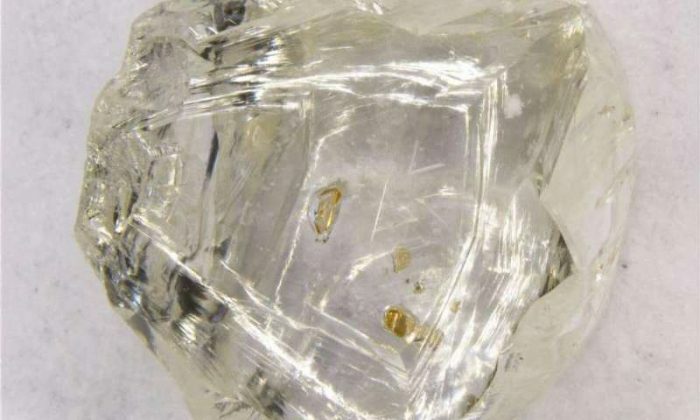 The reactions needed to create such substances are familiar to scientists only at the much higher temperatures and pressures of earth and earth-based laboratories. The fact that they were found indicates that these chemical reactions in interstellar clouds take place faster than suspected, likely in gas-phase reactions unfamiliar to organic chemistry as observed on earth. What was newly revealed this week is that it is possible to determine the 3D structure of an interstellar cloud. The advance not only reveals the true structure of the molecular cloud Musca, which differs from previous assumptions in looking more like a pancake than a needle. 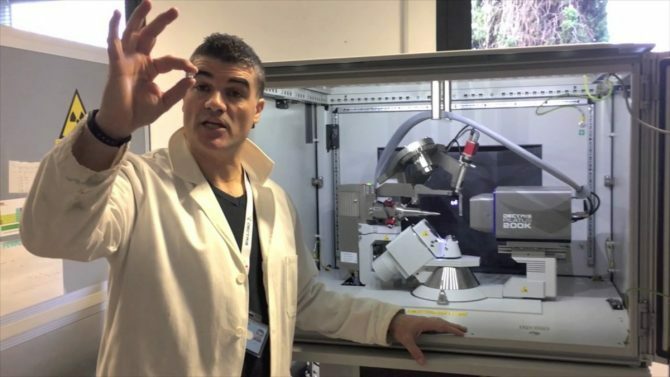 But the two authors, astrophysicist Konstantinos Tassis of the University of Crete and Aris Tritsis, now a postdoctoral fellow at Australian National University, say their discovery will lead to a better understanding of the evolution of interstellar clouds in general. This, in turn, which will help astronomers answer the longstanding questions of how and why the enormous number and wild variety of stars exists in our galaxy and beyond. In an email, Tritsis said that this is the first time that the 3-dimensional coordinates of an interstellar cloud have been measured. “There have been other crude estimates of the 3D sizes of clouds that relied on many assumptions so this is the first time we were able to determine the size with such accuracy and certainty,” he wrote. Their pathway in to mapping a 3D cloud was the striations (wispy stripe-like patterns) they detected within the cloud. They show that these striations form by the excitation of fast magnetosonic waves (longitudinal magnetic pressure waves) – the cloud is vibrating, like a bell ringing after it has been struck. “What we have actually found is that the entire cloud oscillates just like waves on the surface of a pond,” he wrote in his email. “However, in this instance is not the surface of the water that is oscillating but the magnetic field that is threading the cloud. Furthermore, because these waves get trapped, they act like a fingerprint. They are unique and by studying their frequencies we can deduce the sizes of the boundaries that confined them. With the determination of its 3D nature, the scientists modeled a cloud that is ten times more spacious than earlier thought. From the 3D reconstruction, the authors were able to determine the cloud’s density. Tritsis and Tassis note that, with its geometry now determined, Musca can be used to test theoretical models of interstellar clouds. “Because of the fact that Musca is isolated and it is very ordered, it was the obvious choice for us to test our method,” Tritis wrote. “However, other clouds out there could also vibrate globally. “Knowing the exact dimensions of Musca, we can simulate it in great detail, calculate many different properties of this particular cloud based on different star formation models, and compare them with observations. And in that way, the discovery is very much a part of the long and broad sweep of astrobiology. NASA recently announced that JWST’s launch would be delayed several months, from October 2018 to no later than June 2019, because components of the telescope are taking longer to integrate than planned. The elephant in the room in this discussion is easy to identify — the administration’s well-publicized desire to set up an on-going human colony of Americans on the moon, or at least to get astronauts back on the lunar surface during the 2020s. The stated goals are exploration, commercial and international joint ventures and geopolitics, with seldom a mention of science. During the 1960s the NASA budget (which was directed in large part into the Mercury and Apollo manned missions) took up as much as four percent of the federal budget (the equivalent of $40 billion today.) For six years it took up three percent or more of the budget. The NASA budget is now at its lowest point since 1959 as a percentage of the federal budget since — less than one-half of one percent of the budget — and provides less than $20 billion and has for decades. Another sign of the lowering profile of NASA science is the proposal in the 2019 budget to launch the other NASA flagship science mission of the 2020s, the flyby of Jupiter’s moon Europa, on a commercial heavy-lift rocket rather than NASA’s Space Launch System. The SLS was sold to Congress as the vehicle that could send spacecraft speedily to outer planets, but now both production delays and a desire to quickly get astronauts into space on the SLS has made that far less likely and some years further out, if at all. Northern Lights over north western Norway. Most of the lights are green from collisions with oxygen, but some are purple from nitrogen. © Copyright George Karbus Photography. But a magnetic field does not a habitable planet make. Mercury has a strong magnetic field and is certainly not habitable. Mars also once had a weak magnetic field and stir has some remnants on its surface. But it fell apart early in the planet’s life, and that may well have put a halt to the emergence or evolution of living things on the otherwise habitable planet. 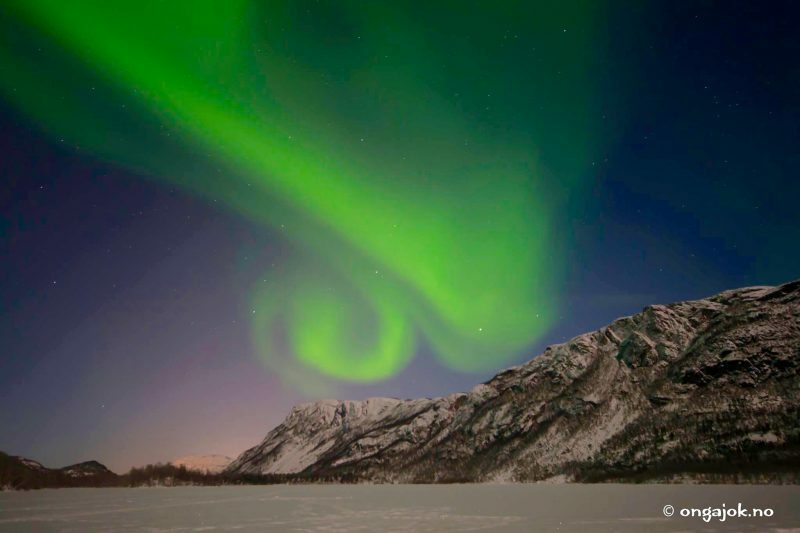 I will return to some of the features of the northern lights and the magnetism is makes visible, but this is also an opportunity to explore the role of magnetism in biology itself. This was a quasi-science for some time, but more recently it has been established that migrating birds and fish use magnetic sensors (in their beaks or noses, perhaps) to navigate northerly and southward paths. But did you know that bacteria, insects and mammals of all sorts appear to have magnetic compasses as well? They can read the magnetism in the air, or can read it in the rocks (as in the case of some sea turtles.) A promising line of study, pioneered by scientists including geobiologist Joseph Kirschvink of the California Institute of Technology (Caltech) and the Earth-Life Science Institute (ELSI) in Tokyo, is even studying potentially remnant magnetic senses in humans. But how does it work for animals? How do they receive the magnetic signals? This is a question of substantial study and debate. One theory states that creatures use the iron mineral magnetite — that they can produce and consume – to pick up the magnetic signals. These miniature compass needles sit within receptor cells, either near a creature’s nose or in the inner ear. Another posits that magnetic fields trigger quantum chemical reactions in proteins called cryptochromes, which have been found in the retina. But no one has determined how they might send signals and information to the brain. He said that when the sun is particularly angry and active, the geomagnetic storms that occur around the planet seem to interfere with these magnetic responses and that animals don’t navigate as well. Kirschvink sees magnetism as a possibly important force in the origin of life. Magnetite that is lined up like beads on a chain has been detected in bacteria, and he says it may have provided an evolutionary pathway for structure that allowed for the rise of eukaryotes — organisms with complex cells, or a single cell with a complex structures. Kirschvink and his team are in the midst of a significant study of the effects of geomagnetism on humans, and the pathways through which that magnetism might be used. That’s rather a long way from some of the early biomagnetism discoveries, which involved the gumboot chiton. A mollusk relative of the snail and the limpet, the gumboot chiton holds on to rocks in the shallow water and uses its magnetite-covered teeth to scrape algae from rocks. The teeth are on a tongue-like feature called the radula and those teeth are capped with so much magnetite that a magnet can pick up the foot-long gumboot chiton. The underside of a gumboot chiton, with its teeth covered with magnetite, can be lifted up with a magnet. No image credit. Back at most northern and southerly regions of the planet, where the magnetic field lines are most concentrated, the lights put on their displays for ever larger audiences of people who want to experience their presence. Our grand night was one of the special ones when the colors (almost all greens, but some reds too) were so bright that their shapes and movements were easy to see with the naked eye. Good cameras (especially those with batteries that don’t freeze) see and capture a much broader range of the northern light presence. The horizon, for instance, can appear just slightly green to the naked eye, but will look quite brightly green in an image. 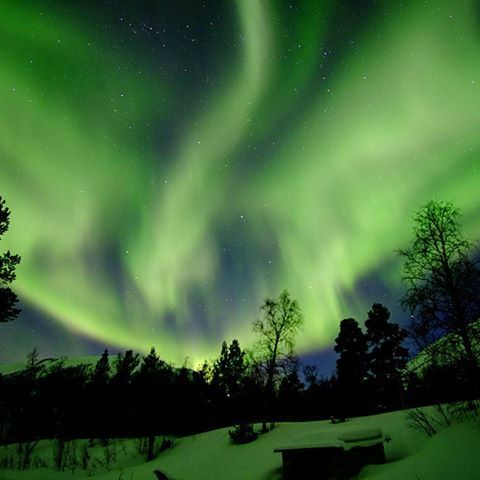 Thanks to the National Oceanic and Atmospheric Administration, the National Weather Service and NASA, forecasting when and where the lights are likely to be be active in the northern and southern (the Aurora Australis) polar regions. This forecasting of space weather revolves around the the eruption of solar flares. The high-energy particles they send out collide with electrons in our upper atmosphere accelerate and follow the Earth’s magnetic fields down to the polar regions. Models based on measuring solar flares, or coronal mass ejections, coming from sunspots that rotate and face Earth every 27 or 28 days. Summer months in the northern hemisphere often make the sky too light for the lights to be seen, so the long winter nights are generally the best time to see them. But they do appear in summer, too. (NOAA). In these collisions, the energy of the electrons is transferred to the oxygen and nitrogen and other elements in the atmosphere, in the process exciting the atoms and molecules to higher energy states. When they relax back down to lower energy states, they release their energy in the form of light. This is similar to how a neon light works. The aurora typically forms 60 to 400 miles above Earth’s surface. All this is possible because of our magnetic field, which scientists theorize was created and is sustained by interactions between super-hot liquid iron in the outer core of the Earth’s center and the rotation of the planet. The flowing or convection of liquid metal generates electric currents and the rotation of Earth causes these electric currents to form a magnetic field which extends around the planet. If the magnetic field wasn’t present those highly charged particles coming from the sun, the ones that set into motion the processes that produce the Northern and Southern Lights, would instead gradually strip the atmosphere of the molecules needed for life. 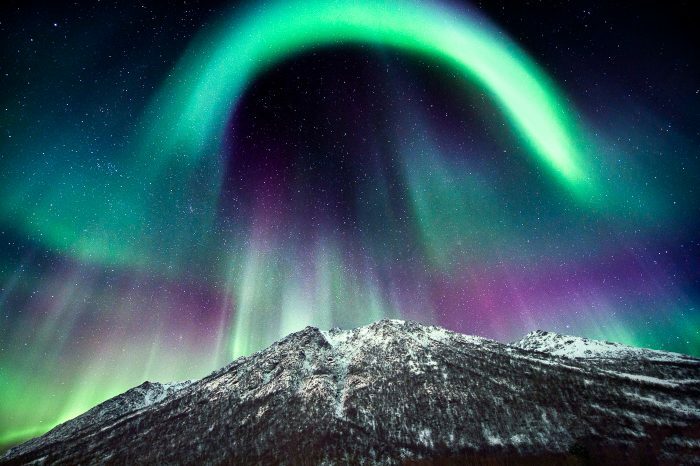 This intimate relationship between the magnetic field and life led to me ask Kirschvink, who has been studying that connection for decades, if he had seen the northern or southern lights. No, he said, he’d never had the chance. But if ever in the presence of the lights, he said he know exactly what he would do: take out his equipment and start taking measurements and pushing his science forward. With its call for extraterrestrial habitability white papers, the NASA got more than 20 diverse and often deeply thought out offerings. The papers will be studied now by an ad hoc, blue ribbon committee of scientists selected by the NAS, which will have the first of two public meetings in Irvine, Calif. on Jan. 16-18. I’m particularly familiar with two of these white paper processes — one produced at the Earth-Life Science Institute (ELSI) in Tokyo and the other with NASA’s Nexus for Exoplanet System Science (NExSS.) What they have to say is most interesting. “This is an ‘all-hands-on-deck’ problem, and we held a workshop to start drawing a wide variety of scientists to the problem. Once we did, the group gave itself an ambitious goal – to quantify an assessment of whether or not an exoplanet has life, based on remote observations of that world. Chaitanya Giri, a research scientist at ELSI with a background in organic planetary chemistry and organic cosmochemistry, said that his work on the European Rosetta mission to a comet convinced him that it is essential to “develop technological capacities to explore habitable niches on various planetary bodies and find unambiguous signatures of life, if present.” There is some debate about the organic molecules — the chemical building blocks of life — identified by Rosetta. “Over the years there have been scattered attempts at building such instruments, but a coherent collaborative network was missing,” Giri said. “This necessity inspired me to put on this workshop,” which led to the white paper. Identify promising key research goals in the field of the search for signs of life in which progress is likely in the next 20 years. Identify key technological challenges in astrobiology as they pertain to the search for life in the solar system and extrasolar planetary systems. Quite a wide net, from specific issues to much broader ones. But the teams submitting their papers are not expected to address all the issues, but only one or perhaps a related second. The papers range from a SETI Institute call for a program to increase the use of artificial intelligence and machine learning to address a range of astrobiology issues; to tempting possibilities offered by teams already in the running for future missions to Europa or Enceladus or elsewhere; to recommendations from the Planetary Science Institute about studying and searching for microbialites, living carbonate rock structures once common on Earth and possibly on Mars as well. Microbialites are fresh water versions of the organic and carbonate structures called stromatolites — which are among the oldest signs of life detected on Earth. The white paper from ELSI focuses how to improve and discover technology that can detect potential life on other planets and moons. It calls for an increasingly international approach to that costly and specialized effort. Other technologies they see as promising and needing further development are high-sensitivity fluorescence microscopy techniques that may be able to detect extraterrestrial organic compounds with catalytic activity surrounded by membranes, i.e., extraterrestrial cells. In addition, they support on-going and NASA-funded work on genetic samplers that could go to Mars and — if present — actually identify nucleic acid-based life. “With back-to-back missions under development and proposed by various space agencies to the potentially habitable Mars, Enceladus, Titan, and Europa, this is a right time for a detailed envisioning of the technologies needed for detection of life,” Giri said in an e-mail. 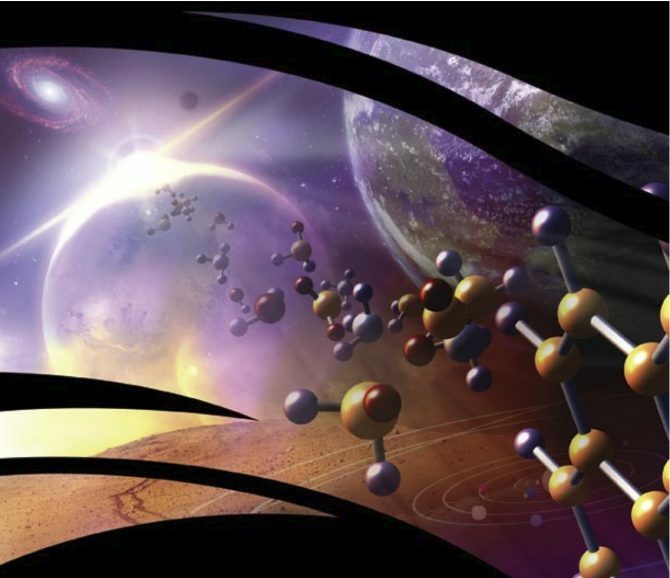 The NExSS white paper is an especially ambitious one, and focuses on potential biosignatures from distant exoplanets. The NASA-sponsored effort brought in many top scientists working in the field of biosignatures, and in the past year has already resulted in the publication or submission of five major science papers in addition to the white paper. In most basic terms, the Bayes approach describes the probability of an event based on prior knowledge of conditions that might be related to the event. A simple example: Runners A and B have competed four times, and runner A won three times. So the probability of A winner is high, right? But what if the two competed twice on a rainy track and each won one race. If the forecast for the day of the next race is rain, the probability of who will be the winner would change. Both Domagal-Goldman and collaborator exoplanet photosynthesis expert Nancy Kiang of NASA’s Goddard Institute for Space Studies are eager to adopt climate modeling and it’s ability to use known characteristics of divergent sub-fields to put together a big picture. For instance, Kiang said, the Global Climate Modeling program at GISS simulates the circulation patterns of Earth’s wind, heat, moisture, and gases, and can make pretty good predictions of what climate conditions will result. She sees a similar possibility with exoplanets and biosignatures. Such a computer model can take in data from different fields and come up with some probabilities. The model “might tell us that a planet is habitable over a certain percent of its surface,” she said. “A geochemist or planetary formation person might then tell us that if certain chemistry exists on that planet, it has good potential for prebiotic compounds to form. A biologist and geologist might tell us that certain surface signatures on the planet are plausible for either life or mineral background.” That’s not a robust biosignature, but the probability that it could be life is not zero, depending on origin of the signature. “These different forms of information can be integrated into a Bayesian analysis to tell us the likelihood of life on the planet,” she wrote. One arm of the NExSS team is already using the tools of climate modeling to predict how particular conditions on exoplanets would play out under different circumstances. I will return to the NExSS biosignatures white paper later, since it is so rich with cutting edge thinking about this upcoming stage in space science. But I do want to include one specific recommendation made by what is called the Exoplanet Biosignatures Workshop Without Walls (EBWWW). What they say is necessary now is for more biologists to join the search for extraterrestrial life. and biologists to advance a process-based understanding for planetary biosignatures. The recommendation, it seems to me, illustrates both the infancy and the maturing of the field. The importance is clear: These sites are “very exciting” for potential human bases as well, says Angel Abbud-Madrid, director of the Center for Space Resources at the Colorado School of Mines in Golden, who led a recent NASA study exploring potential landing sites for astronauts. Water is a crucial resource for astronauts, because it could be combined with carbon dioxide, the main ingredient in Mars’s atmosphere, to create oxygen to breathe and methane, a rocket propellant. And although researchers suspected the subsurface glaciers existed, they would only be a useful resource if they were no more than a few meters below the surface. The ice cliffs promise abundant, accessible ice, Abbud-Madrid told Science Magazine. While the discovery adds to the view that Mars is neither bone-dry now nor was earlier in its history, it does not necessarily add to the question of where all the Martian water has gone or how much was originally there. That’s because the paper describes the huge ice deposits as the result of snowfall over more recent eons that was packed into its current form, rather than water that might have been present during the warmer wetter periods of Mars history. With this in mind, Dundas said in an email that his team’s work does not add to what is known about the early Mars water budget. So the ice is relatively young. But that doesn’t mean it has no story to tell. Exposed ice, like exposed rock, always has a story to tell. “We expect the vertical structure of Martian ice-rich deposits to preserve a record of ice deposition and past climate,” the authors write. The eight scarps studied were steep and faced the poles. All were in the mid-latitudes, and therefore far from the polar ice sheets. NASA has long had a motto for exploring Mars and other sites beyond Earth of “follow the water.” That has been expanded to “follow the carbon” and “follow the organics,” but the water is still a guidepost of sorts of where life, or its remnants, might be found. Now with these large and seemingly accessible deposits of water ice, “follow the water” takes on a new meaning for potential future astronauts in search of essential chemical components. Still, the issue of just how much water there is and has been on Mars is a central to piecing together the planet’s history and how much of the planet might have one day been eminently habitable. 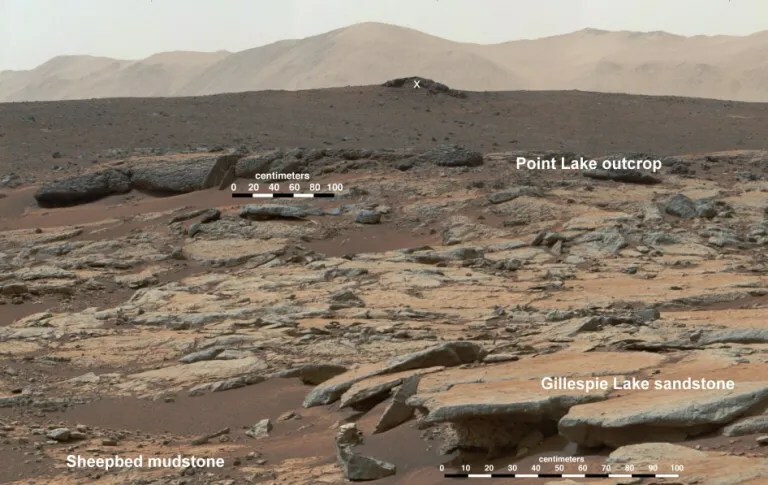 The last decade of Mars exploration and observation has led most Mars scientists to conclude that the planet once had rivers, lakes and possibly a northern ocean. That water is almost entirely (or perhaps entirely) gone from the surface now, and understanding where it went is certainly key to understanding the history of the planet. While much no doubt escaped to space after the early protective Mars magnetic field and atmosphere largely disappeared, researchers say there remains a lot of Mars water to be accounted for. 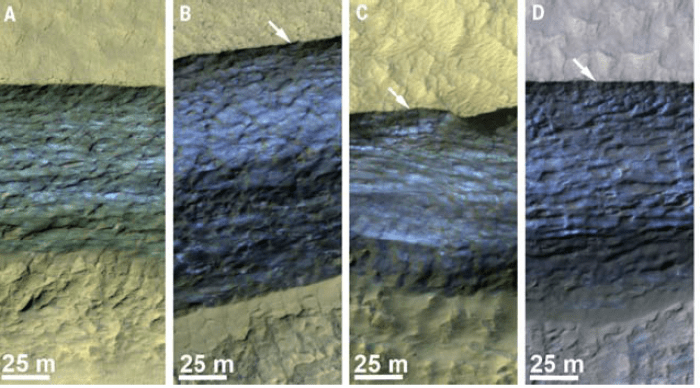 An article in the journal Nature last month reported the possibility of large amounts of water mixing with Martian basalts long ago and forming a broadly water-rich crust. The authors of that paper, led by Jon Wade of Oxford’s Department of Earth Sciences, described modeling that found water on early Mars could be absorbed into spongy rock at a far greater rate than on Earth. In an accompanying review [Nature], geochemist and cosmochemist Tomohiro Usui of the Earth-Life Science Institute in Tokyo, supported the notion, and added another possibility that he has published on as well. 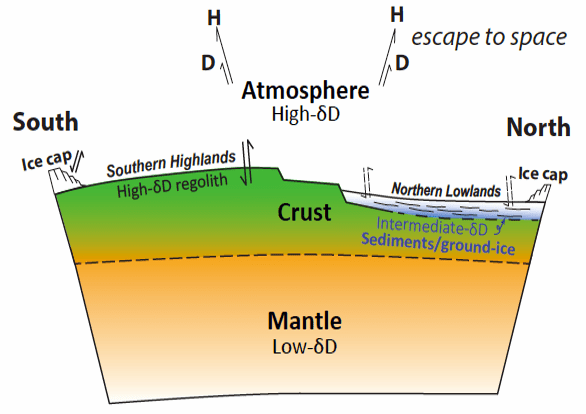 Usui wrote that the ground-ice model has also been proposed based of analyses of hydrogen isotopes in Martian meteorites and of the shapes and characteristics of craters. Indeed, the crater study indicated that the subsurface water ice has a volume comparable to the size of the ancient oceans. Dundas et al reported that the fractures and steep angles found indicate that the ice is cohesive and strong. 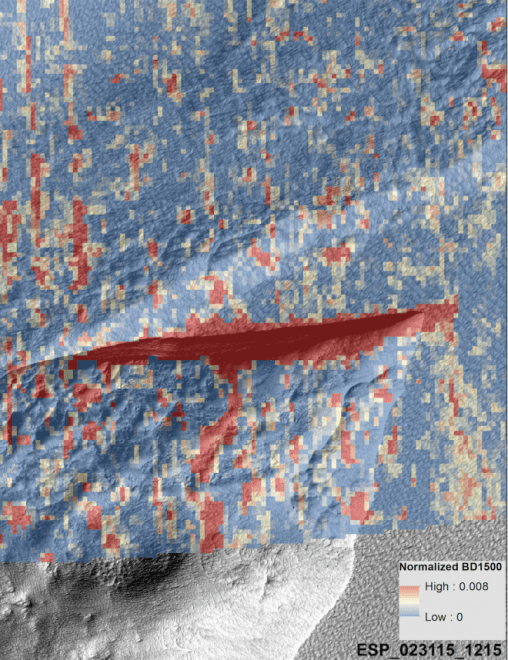 What’s more, bands and variations in color suggest that the ice contains distinct layers, which could be used to understand changes in Mars’ climate over time. Because the ice is only visible where surface soil has been removed, the paper says it is likely that ice near the surface is more extensive than detected in this study. And that could be very important to astronauts on future missions to Mars.